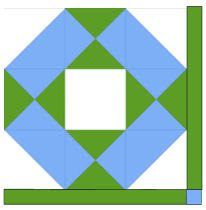 This is it, the last instructions for the Medallion Quilt. 1. Using 10 piece A's and the B's sew together using a 1/4 inch seam. See diagram 1. 1. Sew a sashing strip A to the right side of the blocks in row 1. Using only 3 strips for the row. See diagram 2. 2. Do not join the blocks yet. 3. Repeat for bottom row. 4. 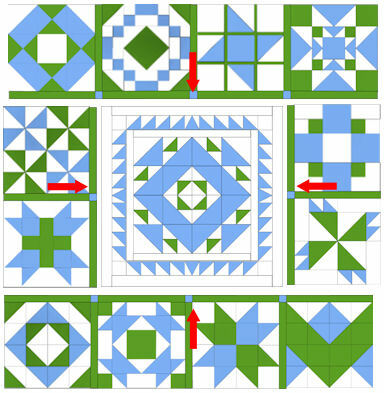 Sew the sashing to 2 blocks on the right side as above and 2 blocks on the left side. See diagram 3.
these blocks are on either side of the center as per layout above. 1. 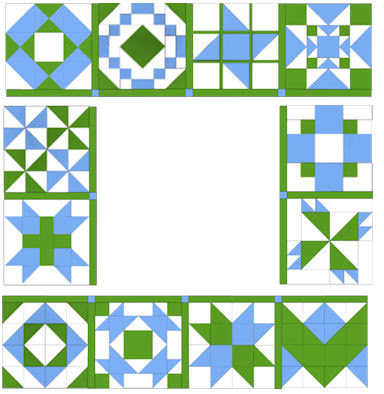 Sew the units from Step 1 to the bottom of the blocks in the top row. See diagram 4. 2. Join the blocks in the top row together. 3. 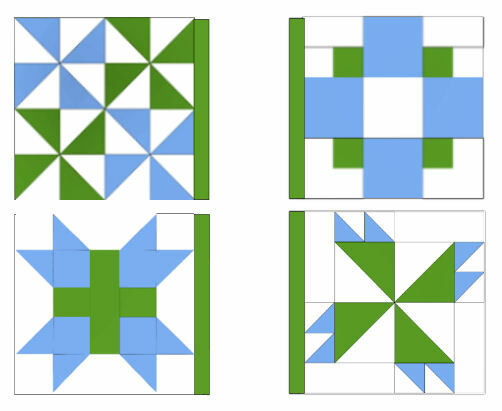 Repeat for bottom row except sew the strips from Step 1 to the top of the row. See diagram 5. 4.Repeat for side blocks. See diagram 5. 1. Join rows to center. Sides first then the top and bottom rows. See diagram 6. Sew the border strips to the unit from Step 4 above. Congratulations you now have a completed top ready to quilt. 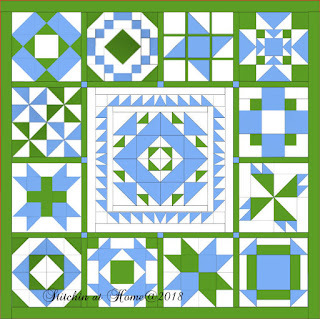 You can get a PDF of this block free in my Craftsy Store. I would love to see any of the blocks you have made, you can post to Instagram using #stitchinathomemedallion2017 Or email me a photo. I look forward to seeing how they all come together when you can share, Cindy! I don't see this one in your Craftsy store. I can't wait to finish mine up. It's going to be a little bit before I get there, but I can't wait! Hurrah for you, Cindy! I didn't stitch along with this one, but I have enjoyed seeing the blocks come together. 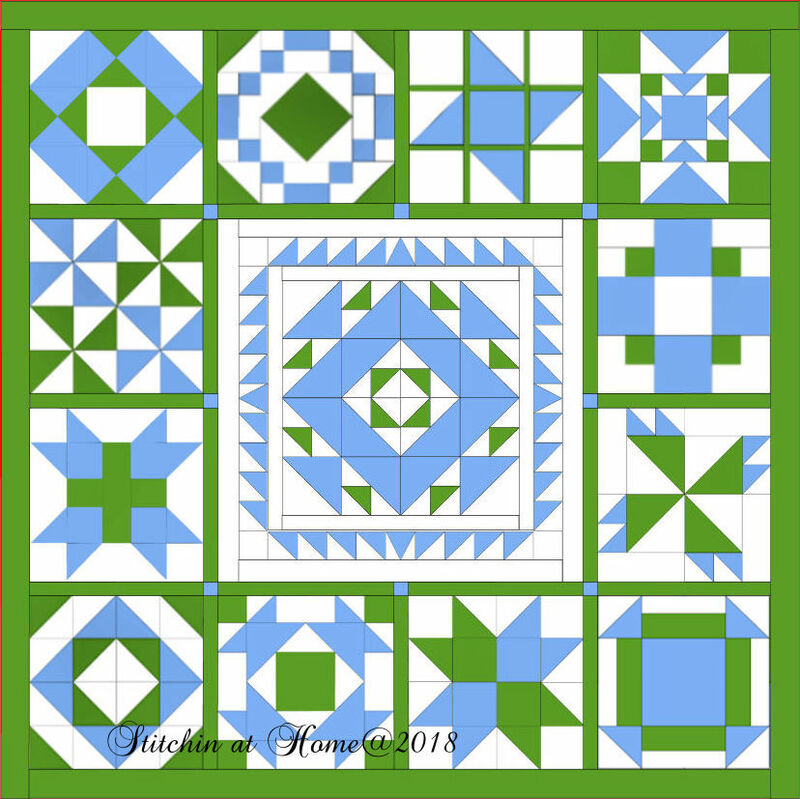 Medallion quilts are my all time favorite!